"Free fusion" solo concert-performance as part of the Crisis Performance Festival #2. 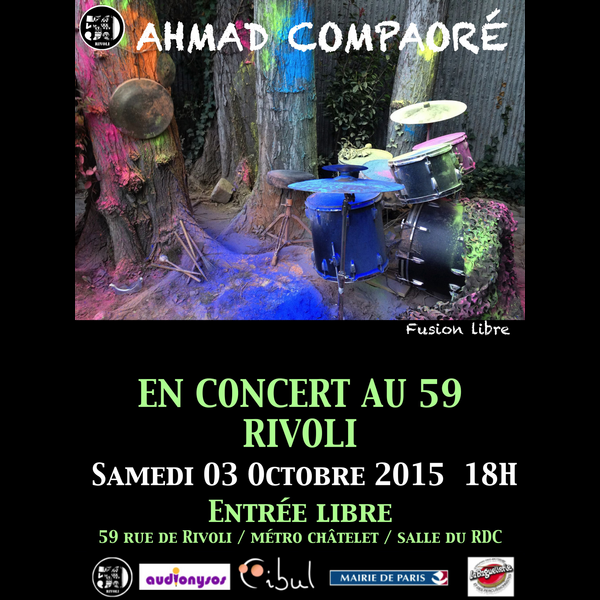 Ahmad Compaoré is a musician of freedom. With feet, fists and hands, he strikes, whips and strokes the brass of the cymbals and the skin of his drums. Of Egyptian and Burkinabé origins, he confirms his singular talent alongside Fred Frith, Marc Ribot, Jamaaladeen Tacuma or Egyptian choreographer Karima Mansour. Skilfully exploring various genres, he teaches drums and contemporary percussion through his association La Boîte à Musique in Marseilles. Free from boundaries, his musical world is a subtle mix of free jazz, fusion and world music, sustained by a compulsive playing made of frantic impetus, abrupt collapses and sudden explosions. With a virtually symbiotic mastery of the instruments he uses, the plasticity of the body contributes to make them vibrate in a connection altogether smooth and unbridled. 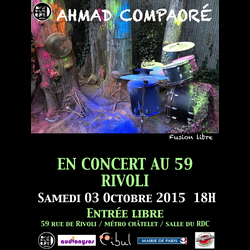 That same evening, Ahmad Compaoré will perform a mini-set as part of "La Nuit Blanche" between 20:00 and midnight.